Helichrysum cymosum – Feature plant at Towerkop Nursery. Related to everlastings, this perrenial shrub volunteered on the allotment at Towerkop nursery. It grows to a metre high and flowers profusely from spring well into summer. 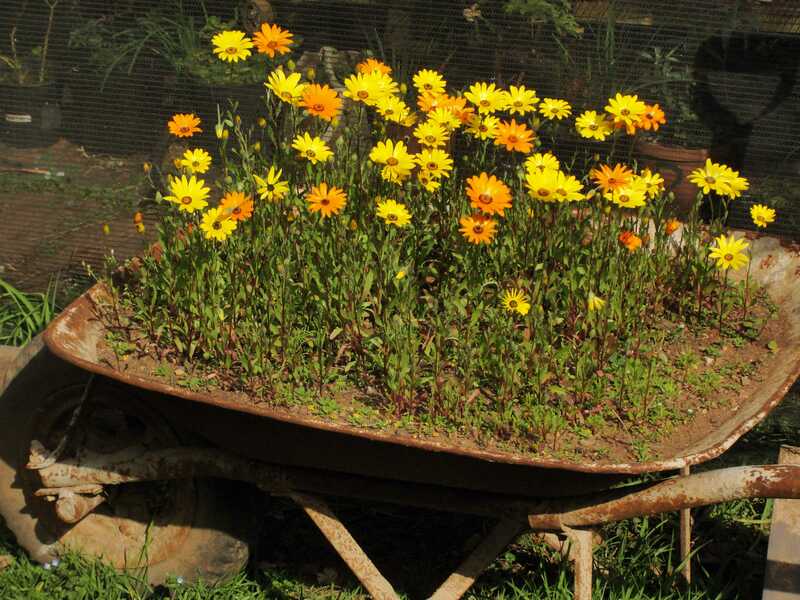 Occurs naturally on sandy slopes in damp places from the southwestern cape to Mpumalanga. Euphorbia caput-medusae (Medusa’s head). Featured plant at Towerkop nursery. Sprawling succulent shrublet with a rosette of warty club shaped branches arising from a short thick stem (caudex). Endemic near Cape town, South Africa found in deep sand and on rocky outcrops. “Euphorbias are characterized by their milky latex. Stipules are usually present, often modified into prickles and spines. Many species produce peduncles (inflorescent stalks) which persist after the cyathia (cup-shaped structures) and capsules have withered. In some species these persistent peduncles become sharpened at the tip and become true spines. The individual flowers, set within a cyathium, which is the basic unit of the inflorescence of euphorbia, are surrounded by a number of bracts which form a unique floral envelope or involucre. The flowers are unisexual with the male flower reduced to a single stamen on it’s own pedicel. Curiously there is never more than one female flower in a cyathium, whereas the male flowers are always numerous. Four new duckies on the farm. Spring daisies in bloom at Towerkop Nursery.